British actor Idris Elba doesn’t really look like Nelson Mandela — at least not the Mandela we knew from his years as president of South Africa and his reign as a kind of national and even global elder. But the actor’s mastery of Mandela’s voice and mannerisms give Mandela: Long Walk to Freedom a solid center. It’s difficult to say whether the 24/7 news-cycle immersion that accompanied Mandela’s recent death will boost interest in this generally successful bio-pic or detract from it. We’ve certainly had plenty of biographical information about Mandela in the last month, and those who have read past the headlines know that not everything about the much-admired leader was universally praised. 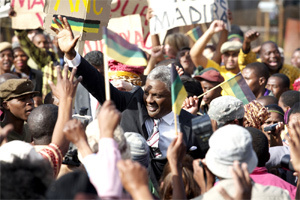 As directed by Justin Chadwick — working from William Nicholson’s adaptation of Mandela’s massive autobiography — Mandela: Long Walk to Freedom is a mostly laudatory big-screen biography that only occasionally crosses the line into hagiography. The sprawling, stylistically agitated movie traces Mandela’s development from a radical young lawyer in Johannesburg to his 27 year imprisonment on Robben Island and, finally, to his emergence as a symbol of South African reconciliation. Naomie Harris portrays Mandela’s second wife, Winnie Mandela, in a performance that matches Elba’s, but the screenplay only sketchily outlines the rift between Winnie and her husband: Mrs. Mandela favored violent retribution against those deemed “collaborators” with the government that perpetuated apartheid. Early parts of this two-hour and 21-minute movie suffer from the hasty way in which Chadwick bounces through events that attempt to humanize Mandela by making brief references to early womanizing. We also learn a little about Mandela’s first wife (Evelyn Mase). At times, it almost feels as if Mandela was rushed to completion, but it’s more likely that the filmmakers were hard pressed to find a workable structure for such a towering life. If you’re looking for more than a guide to Mandela and to the struggle against apartheid, you’ll have to supplement your viewing with some reading. Even with a two-hour plus running time, it’s impossible to do more than skim Mandela’s significant and much revered life. This puts a tremendous burden on Elba, who — thankfully — proves himself more than equal to a task that had be as daunting as it was difficult.